Caldwell Companies have SOLD the 51.75 acres it had listed on the south side of Louetta close to the Louetta Glen intersection. Since March of 2011, the property had been listed on Loopnet.com for $2,817,787. Earlier in 2012, the property had been partially cleared. 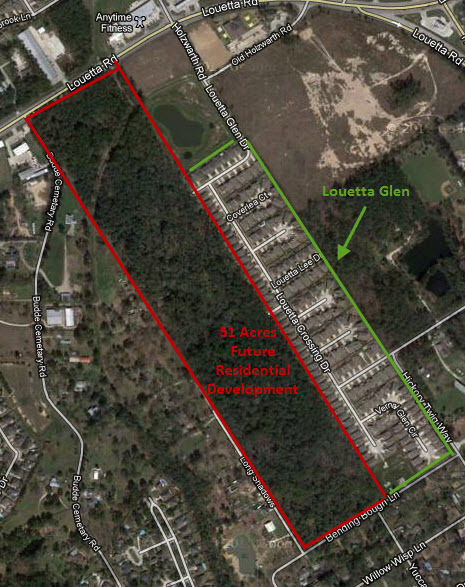 The 51.75 acres were originally planned to be sections 3 and 4 for Louetta Glen, the Spring Texas subdivision located to its east. Unfortunately, Kimball Hill, the home builder of Louetta Glen sections 1 and 2, declared bankruptcy in April of 2008 during one of the worst housing markets in decades. I inquired with Caldwell Companies has to who the builder was going to be but they were tight lipped. Only stating that the property had been sold for residential development. Depending upon the product and its pricing, the housing should be in demand as it is located in the award winning Klein school district and is super convenient to I45, grocery stores, and the EXXON MOBIL campus.